How do I raise my child in faith? 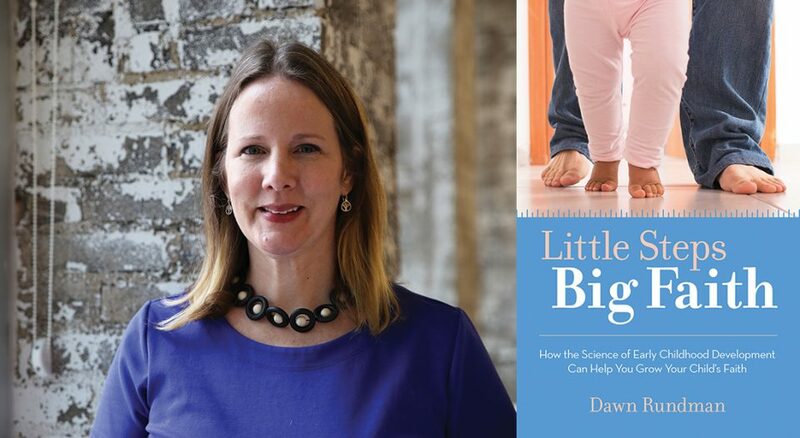 This is the driving question behind psychologist and author Dawn Rundman’s new book, Little Steps, Big Faith (Beaming Books, 2018). Utilizing the latest child development research, the book offers an array of biblically based tips for introducing Christian faith to the littlest Lutherans among us. Rundman first started thinking about kids’ faith formation while working as a professor at Concordia University Chicago. But the idea for Little Steps, Big Faith came years later while she was presenting workshops for parents, teachers and leaders in ELCA congregations and preschools through her work with Augsburg Fortress, the publishing ministry of the ELCA. I spoke with Rundman about her book, the struggle of bringing little ones to worship and our shared baptismal call to foster faith in children. Living Lutheran: Little Steps felt as if it was written for me—I have a toddler at home. Can you tell us more about who this book is for and what it’s about? Rundman: The primary audience is parents of infants and toddlers, but anyone providing regular care for an infant or toddler, such as grandparents, can benefit. Early childhood educators working in a Christian facility could benefit. A tertiary audience is leaders identifying strategic directions for the church. So many Christian parenting books are based on obedience … how the Bible is going to help you when there’s problems. [My book covers how] you look to Scripture and start right away with raising a child and knowing the joy and delight that comes from growing up in a faith tradition. I take findings from early childhood research that can be applied for parents to help shape faith in their children. If we know that young children are drawn to music, for instance, we might ask, “What music are we playing in our home or singing to our child?” It’s pretty easy to make sure some of that is faith-based. I want one of these lullabies to talk [to children] about how much God loves them. Some of that dance party music we play can be camp songs or praise music or other faith-based music. There are things you’re already doing with your children—and there’s a way to fuse faith into them. How did your ELCA background shape your approach to exploring faith formation in young children? Martin Luther insists parents need to be talking about [faith] at home. A child’s religious education is not just up to the preachers. Martin Luther wanted to equip parents with a Small Catechism; he called them “first priests” for their children. The act of accepting God’s gift of children is such an important mission that every congregation should have. … Hospitality starts with not being so closed to families in worship that we give them a negative message. Even if a child’s crying, you have to smile and not say, “Take your kid to the nursery.” I have heard from so many [parents] who don’t come back after [hearing] that. I can totally relate to this. When we visited my in-laws’ church last Easter, I had to take my son out of worship. When we arrived at the nursery, it was locked, with a sign that said: “Nursery closed for Easter. Enjoy time with your family.” I didn’t know what to do. When my kids were little, there was always a woman who sat on the other side of the pew so they couldn’t escape. Not everyone has that gift! Congregations can better support families by thinking of their needs. How can ELCA congregations be more welcoming to families with young children? It means that you might get to be a little uncomfortable with how worship looks and sounds. It means that you might have to get uncomfortable with budget dollars going to child care. It means examining: How does your church nursery look? That’s the primary hospitality space for young families. Does it have age-appropriate toys? Is there free child care? It means, ultimately, developing some deep empathy for families with young children who are struggling to make it out the door to church, let alone on time. Could you talk about what sets your book apart from other parenting books, in the way it discusses routines and rituals? I’ve read so many articles about the significance of the bedtime routine. What are some easy tweaks you can make to existing routines with children to reflect faith? That was one of my favorite stories from your book. Your kids are older now, but can you recall any moments in their lives when you saw faith taking root? We have old home video of my son singing the liturgy when he was 2 years old. He’s singing, “Lord have mercy; Christ have mercy.” We didn’t know he was learning it, [but] he’d heard it enough and knows these words. What’s still important to us is having a weekly church visit. [My children] know what it is to gather as a church family to commune each week. The understanding of being part of a community that eats together every week and remembers Jesus is a pretty powerful thing. Listen to the latest episode of the ELCA’s Three Sides podcast to hear an interview with Dawn Rundman.